Autonomous mobile robots are drawing increasing attention as a means for addressing the challenges society is facing such as shortage of labor. Amid this environment, Panasonic has developed an industrial sensor, the "3D LiDAR" that will serve as the "eyes" for autonomous mobile robots giving them the wide angle of view they need. Focusing on autonomous robots' "eyes"
In the field of manufacturing and logistics , we have faced difficulty such as expansion of shipping volume, labor shortage and increase in labor costs. In order to solve these difficulties, there are high expectations of labor-savings using robots. Among all the different types of robots, autonomous mobile robots that can work with people are especially drawing attention, and this market is expected to expand rapidly. In order to utilize autonomous mobile robots without any human assistance in facilities and outdoors where there is a lot of traffic, they must be able to keep an eye on what is going on ahead and to the left and right of them, as well as bumps and irregularities in the road. In other words, like humans, they need "eyes" that can deliver a wider angle of view, an ability to grasp the surrounding environment in real-time. 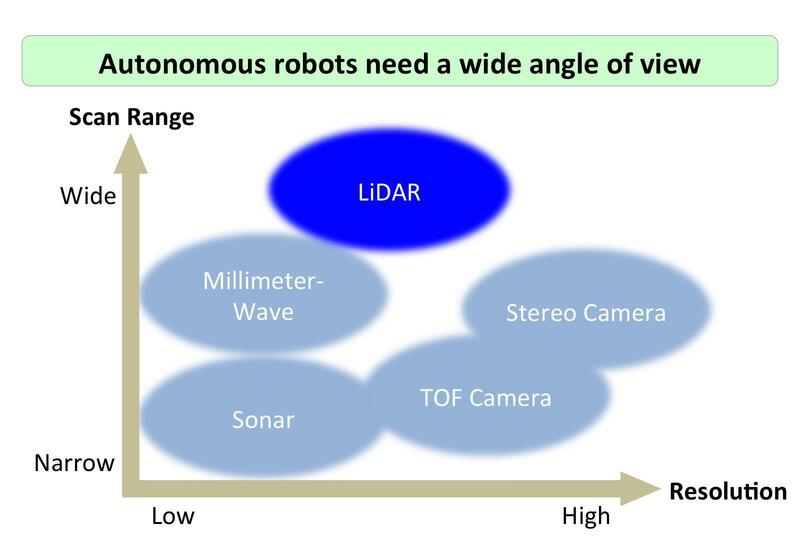 There are several sensors that can serve as robots' eyes, but if they are categorized based on the measurement range and resolution, LiDAR (Light Detection and Ranging) with a wide measuring range is optimal to serve as "eyes" for autonomous mobile robots. 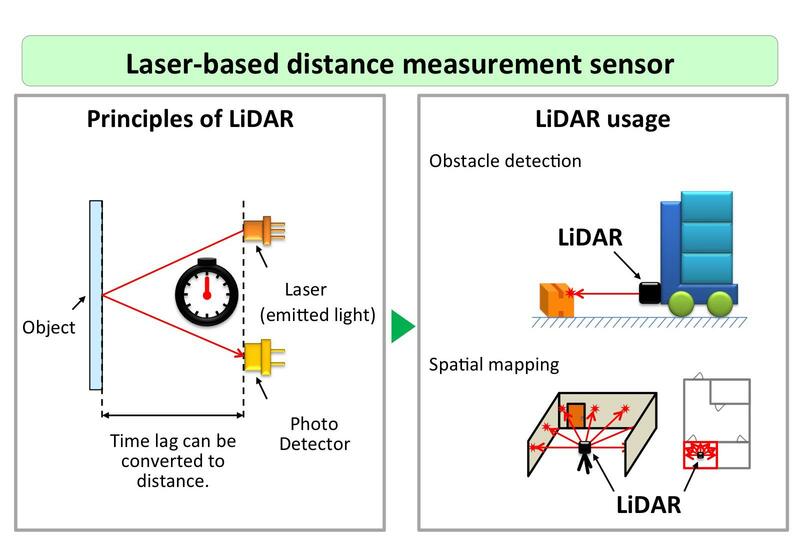 LiDAR measures distance based on the time it takes for the light of Laser to bounce back from the object to the Photo Detector. What is LiDAR (Light Detection and Ranging)? LiDAR is often associated with automotive applications, but automobiles travel fast, so greater importance has been placed on measuring long distances and it cannot measure a wide range of vertical angles. Autonomous mobile robots, on the other hand, move about in areas where there are pedestrians, so they need a wide angle of view to be able to see what is in front and around them. This is why automobiles and autonomous robots need different specifications. Previously, autonomous mobile robots detect objects using a combination of LiDAR for automotive use and other sensors. It is complicated robotics control system. 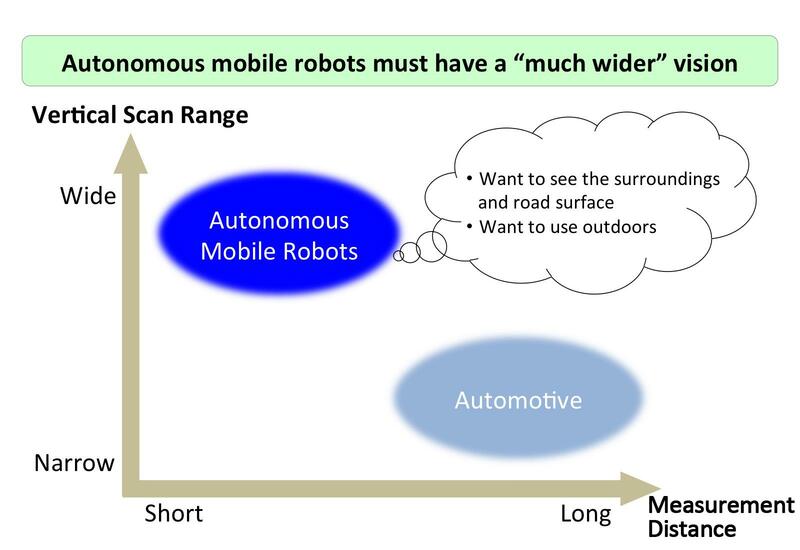 The difference in detection range necessary for automobiles and autonomous robots. 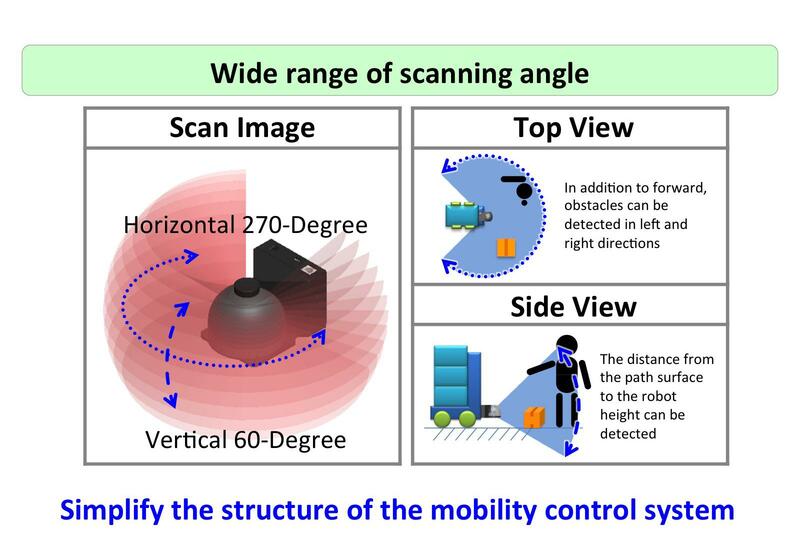 This is why Panasonic developed the "3D LiDAR," which realizes 3D detection of distances with wide angle of view for autonomous mobile robots. 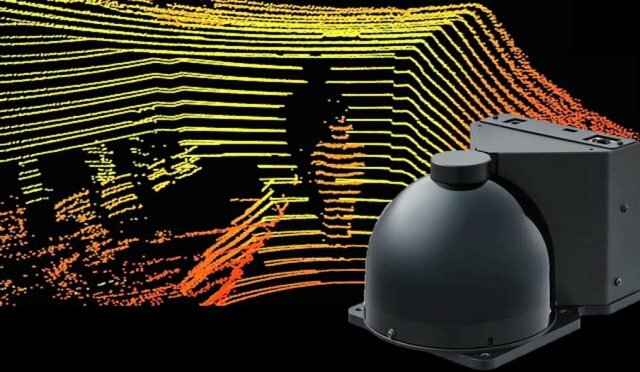 The 3D LiDAR is comprised of 1 laser component, 1 mirror, and 2 motors and adopts a originally laser scan technology that can move the mirror horizontally and vertically across wide angles. More specifically, it has been designed so that 1 motor rotates the mirror horizontally as wide as up to 270 degrees while the other motor rotates the mirror vertically up to 60 degrees. Panasonic has applied the mechanism design technologies and know-how acquired through its optical disc drive business to the development of 3D LiDAR. 3D distance detection sensor, 3D LiDAR. Laser scanning method featuring a unique structural design realizes wide-angle scanning. The 3D LiDAR will make it possible for one sensor to keep an eye on what is at the robot's feet and the road surface, simplify the structure of the motion control system, shorten the time it takes to develop robots, and to reduce production costs. Realized 3D detection of distances with wide angle of view. Top portion of the screen in the video is the image captured by the camera. 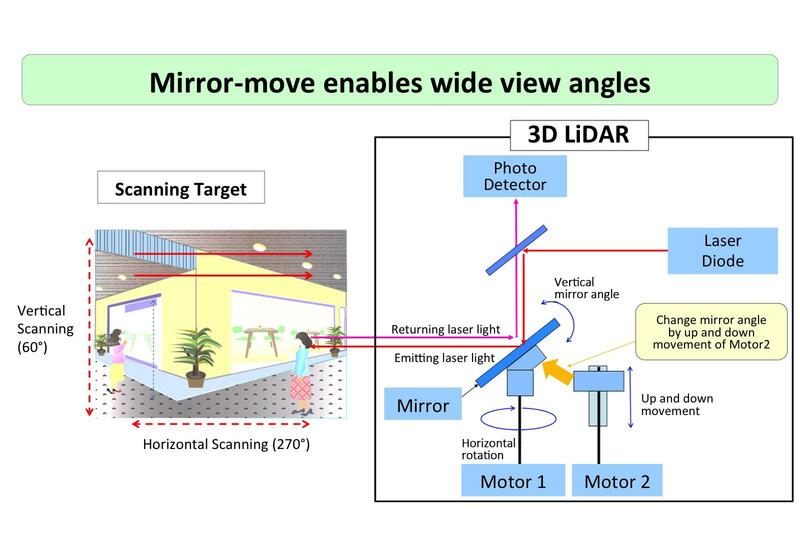 And the bottom is the 3D image scanned by Panasonic's 3D LiDAR showing the distances between objects. The closer the object, the redder it will appear; objects farther away appear in yellow. There are also several modes offering various settings for range of vertical scanning angles and resolution. Depending on the usage, you can set a wide scanning range and high resolution, set the same wide scanning range, but use lower resolution, or limit the scanning range to realize stable and efficient motion of the robot. Moreover, when robots are used outdoors under the sun, by making the return light follow the same path as the emitted laser, Panasonic has reduced the noise induced by bright sunlight. Therefore, the 3D LiDAR can accurately detect distances under strong sunlight. The 3D LiDAR Panasonic has developed is estimated to be used in slow-moving service robots and robots that move autonomously such as autonomous transport and delivery robots. 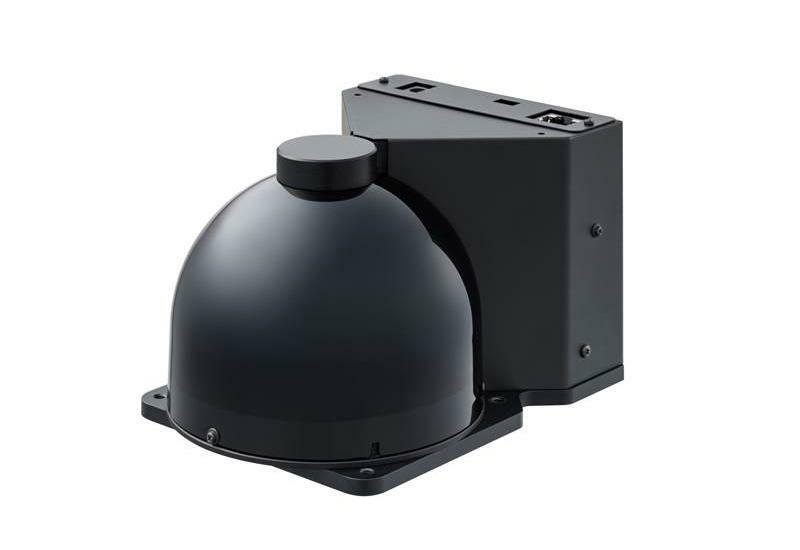 Because of its ability to measure across a wide range, this sensor can also be used in safety applications, and its ability to measure distances in any brightness makes it also optimal for security applications. 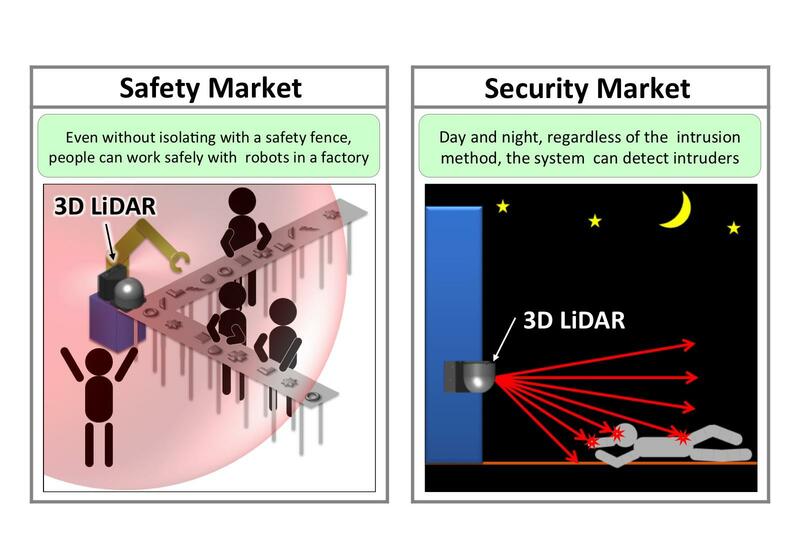 Therefore, applications of the 3D LiDAR will increase exponentially. In order to expand the usage of autonomous mobile robots and ultimately contribute to resolving the challenges society is facing such as a shortage of labor, Panasonic will push forward with the development of the 3D LiDAR to deliver samples in January 2018 and begin mass production by the end of FY2018.